TRIVIA of Noh : Q102 : What kind of people partonized Noh performers in the Warring States period? | Home | Trivia | Q102 : What kind of people partonized Noh performers in the Warring States period? What kind of people partonized Noh performers in the Warring States period? 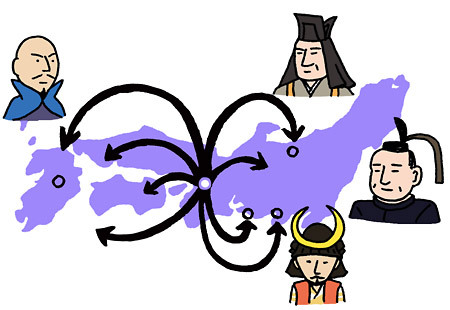 In Japan’s Warring States period, which followed the Ōnin War, the shogunate lost its influence and Kyoto fell into ruin. Noh performers were also pushed into a corner because they had been supported by the Ashikaga family of shoguns. Performers formerly based in the area around Kyoto left for rural areas in search of new patrons. Konparu Zenpo, a grandson of Konparu Zenchiku, depended on the support of the Ōtomo family in Kyūshū. In Odawara, the Hōshō family allegedly served the Hōjō family. On the other hand, one of the most popular actors in Kyoto, Kanze Mototada, went to Hamamatsu and gained the support of Tokugawa Ieyasu, who was to be the founder of the Edo Shogunate. Meanwhile, drummer Okura Nisuke-Toraie received the patronage of Uesugi Kenshin and stayed in Echigo (present-day Nigata), before later returning to Kyoto to achieve fame. It may be said that the age of rival warlords helped the nationwide spread of Noh culture. This surely spearheaded the later prosperity of Noh in the Azuchi-Momoyama and Edo eras.